The above cited early writer states that the D'Aubyn from the Conqueror's army was settled in Gloucestershire at Sledisland in the parish of Aure or Awre. Another writer (fn 4) supposes that, from Aure, part of the family removed to Waterford in southern Ireland, spreading from there over Ireland. It is noteworthy that the Irish families did not develop the use of the final "s" on the name and usually spelled it "Dobbin" with occasional variation. However, Gloucestershire is included in the area (in and on the borders of Wales) in which there was a tendency to add a final "s" to any name on which it could be used, for example, Jones, Williams, Jenkins, etc. This could account for the use of the final "s" by the English families. It is also possible that the name "Dobin", like "Robin", was a diminutive of Robert, and that, like the surname Roberts, it was derived from the given name Robert, possibly that of the father. This would not seem to account for the localization of the name to certain areas of England, notably Gloucestershire and its environs. A third possibility, although probably coincidental, is worthy of passing note. The tribe which inhabited the territory now known as Gloucestershire were known in the British and Roman era (about 300 AD) by the name "Dobuni". (fn 5) Any similarity between "Dobyns" and "Dobuni" is probably coincidental, because of the late date at which surnames were developed. However, in ancient times this tribe carved a huge white horse into the chalk hillside at Uffington in Wiltshire. It is still quite visible. Thus, it is more likely that the "Dobuni" name is perpetuated in the use of the name "Dobbin" as a typical name for a work horse. Some of the early family history reported hereafter is taken from an early report by Ralph Bigland, Garter Principal King of Arms (an officer of the College of Arms, London) to a distant relative of our family. (fn 6) The contents of this report, despite diligent effort, cannot be fully verified by present-day research. Where this research has located source material to verify Bigland's report, the material is cited in the following paragraphs. Even without verification, however, the report is quite likely to be accurate in all respects, as the officers of the College of Arms have traditionally had a reputation for applying high standards of proof. The branch of the family traced herein moved from Aure to the parish of Newent, Gloucestershire, where it had its early seat at Atherload's Place. GUYA DOBYNS is the earliest ancestor discovered and is the first English generation to be considered. ¶5 GUYC DOBYNS (JOHNB, GUYA) (from ¶4) married ELLEN ----. ELLEN DOBYNS died approximately 1536, as shown by attempts to settle her estate which started in 1536 (probably 1536/7). (fn 9) Probably GUYC DOBYNS was no longer living in 1536. ¶6 ALEXANDERD DOBYNS (GUYC, JOHNB, GUYA) (from ¶5) of Newent, gentleman, was married to ANN ----. In 1547, ANN DOBYNS was plaintiff in a libel action against ANN CARVER otherwise WILLIAMS of Newent. (fn 10) The acts of court are missing. The will printed in manuscript form on the previous two pages is written in the English language, and after careful study, the reader should find it possible to read the typescript of the will on page 4 with the manuscript copy of the will. 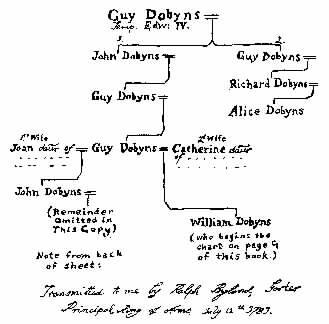 CATHERINE DOBYNS, the second wife of GUYD DOBYNS, was probably living in 1557. At that time, on 17 Apr 1557, Mrs. KATHERINE DOBINS was recorded in the Newent Parish Register (fn 15) as being the Godmother of RANDALL DOBINS, son of WILLIAM DOBINS, Gent. In 1535, King Henry VIII declared himself "Supreme Head of the Church of England", thus beginning the Reformation in England. While the separation of the Church of England from the Roman Catholic Church pleased many people, including Henry VIII who wanted his divorce, there were many people in England who clung to the Pope and the Roman Catholic Church. It appears that GUYD DOBYNS was among those who remained Roman Catholic and was thus styled a Papist by the supporters of the Reformation. In 1535, Henry VIII appointed THOMAS CROMWELL as vicar-general of the Church of England. CROMWELL's job was to root out Papists, among other things. Adherence to the Roman Catholic Church had gone from a requirement of the law in 1533 to a violation of the law in 1535 and later. Freedom of religion was 250 years in the womb of time, and certainly was not to be allowed by THOMAS CROMWELL's men to GUYD DOBYNS. Nor for that matter did the Pope willingly allow CROMWELL's followers their freedom of religion. Thus one should not be surprised to find that, during this period of hard feelings, GUYD DOBYNS found himself in trouble with the self-appointed religious leaders of England. "Letter from Bishop Roland Lee to Thomas Cromwell. One GUY DOBYNS of Newent, being summoned before this Council with his son, refused to come. His son said that he would know the mind of Sir Ant. Poynes first. About a week after, the son killed the constable of Newent and the same day the father broke from the ward of the porter of this Council and fled. The day I was in Gloucester, he was following Mr. Anth. Kyngston, (NOTE that this name is mentioned in the will above.) riding through the town with his hounds, being a J.P. of the shire, 'neither regarding God, nor the King, nor any man there.' Dated Shrowisbury." In the shifting winds of the day, THOMAS CROMWELL lost favor with the king and was executed in 1540, primarily as a sop to the opponents of the methods used to Protestantize England. GUYD DOBYNS apparently rode out the shifting winds unharmed until his death in 1544. During the period of time that he was having trouble with CROMWELL, GUYD DOBYNS was attempting with little success to settle the estate of his mother ELLEN. (fn 18) His difficulties were probably due to the fact that he would have been arrested by the king's officers upon his appearance before the ecclesiastical court having jurisdiction over the estate. On 11 Feb 1536, letters of administration of the goods of ELEN DOBYNS, [Begin original page 8] deceased, late of Newent, were granted to GUYD DOBYNS, her natural (i.e. by birth, as opposed to a step-son, son-in-law, etc., used then in a sense that is now obsolete) and eldest son, to exhibit an inventory at the next court. On which day he was continued to the next court. Afterwards he was suspended and the case continued to 22 Jan 1538/9. He did not appear and was suspended, and on 4 Mar 1538/9 was excommunicated. WILLIAME DOBYNS died approximately 1578, as shown by letters of administration (fn 20) of the goods of WILLIAM DOBYNS, late of Newent, Gloucestershire and the diocese of the city of Gloucester granted on 10 Feb 1578/9 to BLANCHE his relict, in the person of ROBERT SAY, notary public. BLANCHE DOBYNS died approximately 1592, as shown by letters of administration (fn 21) of the goods of BLANCHE DOBBINS, deceased, late of Newent, granted on 20 June 1592 to RANDOLPHF and GUYF DOBBINS her sons. Because the value of the estate was only £31/13/6, they were dismissed from the office as regards the account of 7 February 1593/4 on account of the small sum of the inventory. In the list of children which follows, it is not known whether or not GILESF DOBYNS was a son of BLANCHE DOBYNS. ¶10 GILESF DOBYNS (WILLIAME, GUYD, GUYC, JOHNB, GUYA) (from ¶9) died before RANDALLF DOBYNS wrote his will (fn 22) in 1641. Mentioned in the will of RANDALL were GYLESG DOBYNS, son of GILESF DOBYNS, and MARGARETG DOBYNS, one of the daughters of GILESF DOBYNS. GILESF DOBYNS left no will. ¶11 GUYF DOBYNS (WILLIAME, GUYD, GUYC, JOHNB, GUYA) (from ¶9) died in 1611, leaving a will (fn 23) which mentioned JOHANEG DOBYNS his eldest daughter (under 21), JANEG DOBYNS his second daughter, ANNEG DOBYNS his youngest daughter, his brother RANDALLF DOBYNS, PHILLIP DOBYNS son and heir (apparent) of RANDALLF, his brother GYLESF DOBYNS, URSULA DOBYNS the wife of his brother (the brother was RANDALL), DANYEL DOBYNS his Godson (NOTE that DANYELL was son of bother RANDALL), and THOMAS DOBYNS the son of his brother (unidentified). According to GUY's will, JOHANEG DOBYNS married ---- RASTLE, and ANNEG DOBYNS married VALENTINE POWELL, clerk (i.e. clergy). ¶12 RANDALLF DOBYNS (WILLIAME, GUYD, GUYC, JOHNB, GUYA) (from ¶9) was baptized on 17 Apr 1557, son of WILLIAME DOBINS, gentleman. (fn 24) Godfathers were Mr. GRISKINS and Mr. JOHN DABITOT, and the Godmother was Mrs. KATHERINE DOBINS, probably the widow of GUYD DOBYNS, and the grandmother of RANDALLF DOBYNS. RANDALL attended St. Mary Hall, Oxford, and was afterwards taught the law of the land. (fn 25) RANDALLF DOBYNS married URSULA KIRLE, daughter of ROBERT KIRLE of Walford, Herefordshire, Esq. Chart of some of the descendants of WILLIAME DOBYNS, continued from the chart on page 3. "In the name of God Amen the nynth day of August in the seaventeenth year of the Raign of our Sovraign Lord Charles by the grace of God of England Scottland Fraunce and Ireland King Defender of the Faith et Anno Dom one thousand six hundred forty one I Randall Dobyns of Compton within the parish of Newent in the county of Gloucester, being in perfect memory Doe ordayne devise and make this my last will and Testament in manner and form following, vizt Imprimis I remand and comitt my soul and body unto the Tuiton of the Almightie Lord God my Creator and maker and unto his sonn Jesus Christ my Lord God Saviour and Redeemer and unto God the holy Ghost my Sanctifier and Comforter three persons in Trinity and our God head in Unity, and my most mercifull Lord God whom I pray and humbly beseech to remitt and forgive unto me all my sinns iniquities transgression and offenses which I have committed in [Begin original page 10] thought Worde and Deede, the which I do knowe and doe and must confesse and acknowledge to bee very many of and for the which I doe most earnestlie repent and am hoariblie sorry. And alsoe I doe humblie beseach my most mercifull and lovinge Lord God when it shall please his Divine Maiestie to take and receive my soule and body as one of his elect and chosen servants (of which number I doe hope trust and verilie believe that I am one) to Reigne with his sonne Jesus Christ my Lord and Savior and others his most blessed people children Servants and Saints in his eternall and everlastinge Kingdome of heaven there to give him Laud and praise for evermore. Amen. Now as concerning all the landes goods chattles money plate and debts oweinge unto me which God in his goodness and mercy hath given and lent unto me in this worlde that which I may bequeath give devise and dispose, I will give devise dispose and bequeath the same as followith. And for that I would (for as much as in me lyeth) avoid the unfittinge resorte to my funerall of vagrant and disorderly people and of those that have no need to receive dole, and to the end that the poor people only shall have that which I shall by this my will give to them. Imprimis therefore I doe give and bequeath unto the poore people of the Towne and parish of Newent the some of Six pounds of lawful money of England. And to the poor people of Redmarley Dabitott the some of Twenty shillings. And to the poor people of Oxenhall five shillings. And to the poor people of Pauntley five shillings. All the somes to be distributed by my Executor to such persons of the said parishes respectivelie and in such proportions as he shall think to have most need. 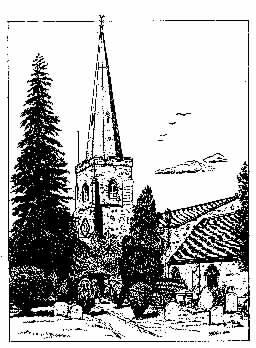 Item I give and bequeath to the parish wardes Newent aforesaid towardes the repairation of the parish church of Newent aforesaid Six shillings and eight pence of lawful money of England. Item whereas my sonne Daniell Dobyns now oweth unto me at the tyme of this my will making the some of Three hundred and twenty pounds of lawful money of England whereof two hundred and fiftie pounds is due to me by my sonne Daniell by specialtie which said pounds I doe intende shall remaine in his hands untill the time of my decease, My will and meaninge is And I doe hereby give bequeath and remitt unto him the some of One hundred and twenty pounds as a Legacie given to him. And the residue thereof being Two hundred pounds, I give and bequeath unto Edmund, Richard, Cicillia and Ursula Dobyns the sonnes and Daughters of my said sonne Daniell Dobyns to be equally shared distributed and divided between them (vizt) To each of them the some of fiftie pounds which said somes of legacies to them given my will and desire is that my son Daniell Dobyns theire father shall imploy for theire benefitts in such manner as hee shall thinke and conceive to bee most beneficial and availeable for theire profitt and behoose. And to pay the same with the enterest thereof unto them evenally and respectivelie as they shall severally and respectivelie accomplish their formall ages of one and twentie years or be married (vizt at which of the said tymes that shall first happen or come to pass. Item I give and bequest unto the said Edmund Dobyns my Cloak with all the furniture thereunto belonginge. And my will is that my Executor shall upon reasonable request deliver up unto my said sonne Daniell theise specialties which are or shall bee in my Custodie, or such of them as my Executor shall or may lawfully come by at the time of my Decease, concerning the said legacies given to my said sonne and his children. And alsoe I doe remitt forgive and bequeath unto my saide sonne Daniell all and every such some and somes of money and goods as my wife Ursula did in her life tyme give or lend unto him. Item I give and bequeath unto Anne Dobyns one of the Daughters of my said sonne Phillippe the some of one hundred of lawfully money of England. Item I give and bequeath unto Ellinor Anne Dobyns the youngest Daughter of my said sonne Phillip Dobyns all my feildes, groundes and landes called or known by the names or name of the Botlowes or the boslowes with the appenances situate lyeinge or being in Compton within the parish of Newent aforesaid in the County of Gloucester To have and to hold all the said feildes groundes and landes called Botlowes or the Boslowes unto the said Ellinor Anne Dobyns and her assignes unto the ende of the tearme of Ten Yeares next after my decease provided alwaies that itt shall not bee lawful for the said Ellinor Anne Dobyns nor for her assigns to make any wast or spoyle upon the said premisses. Item. My will is and I doe hereby give bequeath and devise unto William Dobyns the sonne of my said sonne Phillippe Dobyns all the said feildes grounds and landes called Botlowes or the Boslowes with the appenances. To have and to hold the same unto the said William Dobyns and his heirs and assignes forever from and ymediatlie after the end and expiration of Ten years next after my decease as aforesaid. Item whereas I doe hould of the Deane and Chapter of the Cathedral church of the holy and indivisible Trinity in Gloucester by Indenture of Lease bearing date the twenty seaventh day of October in the Tenth year of the Raign of our Sovereign Lord Charles the Kings Ma[jes]tie that now is. All that messuage or Tenement, and alsoe one garden to the same adioyneinge togeather with all houses buildings edifices backesides and other Easements and comodities to the same belonging, situate lyeinge and knowne in the North Gate [Begin original page 11] Streete within the parish of Saint John the Baptist within the City of Gloucester for divers years yet to come and unexpired as in and by the said Indenture of lease more plainely and att large itt doth and may appeare. I doe give devise and bequeath all my estate right title interest and tearme of years which I have yet to come and which are unexpired of and in the said messuage or tenement and olsoe the premisses with the apptenances togeather with the sd Indenture of lease to the aforesaid Daniell Dobyns my sonne To have and to hould the same to the said Daniell Dobyns my sonne and to his Executors and assigns for and duringe all the said tearm of yeares which are yet to come and unexpired of and in the same. Item. I give and bequeath unto Samuel Dobyns gent my Nephew and godsonne a price of gold of Ten shillings. Item I give and bequeath unto Anne the now wife of Valentine Powell Clerke, the said Anne being my neice and goddaughter a price of gold of Ten shillings. Item I give and bequeath to Joane Rastle my Neice a price of gold of five shillings. Item I give and bequeath to Gyles Dobyns the sonne of my brother Giles Dobyns deceased six pounds of lawfull money of England to be paid and delivered to him within the space of one whole year next after my Decease if hee then shal bee livinge. Item I give and bequeath unto Margaret Dobyns one of the Daughters of my said brother Gyles Dobyns three pounds six shillings and eight pence of lawfull money of England to be paid to her within one year next after my Decease if she shal bee then livinge. Item I give and bequeath to such servaunt and servts which shal be dwellinge with mee at the tyme of my Decease five shillings a peice. Item as concerninge all the rest of my goods househould stuffe money plate debts oweing unto mee and chattles not herein or hereby given or bequeathed. I give and bequeath unto Phillippe Dobyns my sonne whome I doe make constitute ordayne and appoynte to be my full whole and sole Executor of this my last will and Testament. And I doe request my loveing wellbeloved and much respected good Nephews Frauncis Lyll Esq. and Samuell Dobyns gent to be my supervisors of this my last Will and Testament to see and procure the same as neare as they canne or may be Duely and truly performed. And for theire pains takinge therein I doe give and bequeath unto them Ten shillings A peice the which I will that my said Executor shall pay and deliv unto each of them not with standing my former guifte unto the said Samuell before given unto him, and my meaninge and desire is that if any doubt shoulde arise concerninge this my will wherein itt may have a doubtful of severall construccon in any part thereof. That then my said supervisors shall decide the same accordinge as they shall conceive to be agreeable to my true intent and meaninge. In witness whereof I have hereunto sett my hande and seale the day and yeare first above written. This will was proved before Sr. Nathaniel Brent Knt pr this 30th daie of Julie 1651 By the oath of Phillip Dobbins the sonne and Executor & To whom & he first by vertue of a commission legally sworn well & truly to administer the same. In the doorway to the Newent Parish Church is (in 1967) an old plaque which reads "A Catalogue of the Benefactors to the Poor of Newent, ending in the VII year of the reign of King George whom God preserve....Giles Nansan Esqr & RANDALL DOBYNS Gent gave an Almes house consisting of 8 dwellings...." An early writer (fn 29) states that "Giles Nansan, Esq. and RANDALL DOBYNS, Gent. gave by deeds in 1631 and 1639, and William Roberts, Gent in 1690, whether by Deed or Will is uncertain, an Almes House, consisting of Ten Tenements with Gardens, for Poor Parishioners. The Trustees being all deceased, the Minister and Churchwardens nominate to the Vacancies..."
The will of PHILLIP DOBYNS of Compton, parish of Newent, Gloucestershire, gent, written 16 July 1651, proved 3 Dec 1651, states that he was weak in body, left a gift to the poor of the town and parish of Newent, and mentions wife ELIANOR, deceased father, daughter ELIZABETH the wife of JOHN COWCHER gent, her son and heir apparent JOHN COWCHER the younger, land purchased by my father of one THOMAS DOBBINS in Newent, my daughter ANNE, my youngest daughter ELLIANORANNE DOBINS, my said two older daughters, and my brother DANIELL DOBINS gent. ELLINORANNE DOBYNS was sole executrix. Overseers were FRANCIS LILL, JOHN BERECRAFT, Esq. and SAMUELL DOBINS gent. Signed by PHI: DOBINS. Proved at London by ELIANOR DOBYNS, daughter of the deceased and executrix named. It may be that there were two sons named WILLIAM DOBYNS (not particularly uncommon then) the first of whom died in infancy in 1611 and the second of whom was living at the time his grandfather RANDALLF DOBYNS wrote his will in 1641, but who was not mentioned in his father's will written in 1651. It is also possible that the WILLIAM DOBYNS who died in infancy can be attributed to an error in recording the gravestone inscription above. The parish register does not record the death of any WILLIAM DOBYNS during this period of time who could be the son of PHILLIP. ¶14 DANIELG DOBYNS (RANDALLF, WILLIAME, GUYD, GUYC, JOHNB, GUYA) (from ¶12) was probably born about 1600. On 17 Sept 1613, DANIEL DOBBINS was entered on the records of the Draper's Company, London, as having been apprenticed to MARTIN ELLIS of that company for eight years. (fn 33) As an apprenticeship was generally set to expire on or about the twenty-first birthday, it is reasonable to assume that DANIEL was born about 1600. DANIEL was not the first member of his family to be apprenticed to the Draper's Company. On 27 Mar 1576, GUIDO "GUY" DOBBINS, son of ROGERD DOBYNS (probably GUYC, JOHNB, GUYA) of Newent, Gloucestershire, was apprenticed to RICHARD GODDARD for eight years. This ROGER DOBBINS is found in ¶7. For reasons which are not clear, DANIELG DOBYNS did not stay with the Draper's Company. There is an entry in the records at the Haberdasher's Company, London, (fn 34) stating that DANIEL DOBBINS was given freedom of the company "per HUGH HAMERSLEY Alde" about 26 June 1626. In later years, DANIEL DOBBINS of Worcestershire was listed as a liveryman of the Haberdasher's Company in the Poll Tax list of 1641. (fn 35) In later life, DANIEL DOBYNS called himself a haberdasher. In 1634, during the visitation of London, (fn 36) an officer of the College of Arms visited DANIEL DOBBINS of Colman Street Ward, London, and recorded the use of the arms shown in the frontispiece of this book. The officer noted that the arms had been "graunted by WILLIAM CAMDEN, Clarenceux (King-of-Arms) 1616 to Mr. DOBBINS but respited for further proof." DANIELG DOBBINS (DOBYNS) listed his grandfather as WILLIAM DOBBINS of Newent, Gloucestershire, who was married to ---- WARNECOMBE of Wiltshire. He listed his father as RANDALL DOBYNS of Newent, now living there in 1634, who married URSULA, daughter of ROBERT KIRLE of Walford, Hereford, Esq. His older brother was given as PHILLIP DOBBINS. He listed himself as DANIEL DOBBINS of London, "Marchant", married to URSULA, daughter of ROBERT WALLER of Beconsfield, Buckinghamshire, Esq., and their children as EDMUND DOBBINS, the older son, aged about three years in 1634, and RICHARD DOBBINS, the younger son. There is a petition (fn 38) by DANNIELL DOBBINS, merchant of London, dated 1638, reciting that JOHN STEPKIN of Wapping, Middlesex, has prepared a bill in the Court of Chivalry against the petitioner (DOBBINS) for that he hath been written esquire in some pretended deeds and writings by him executed. Petitioner states that he has never claimed any title beyond that of merchant as will be seen (inter alia) "In the late Visitation of London in the Office of Arms." Petitioner complains that STEPKIN has slandered him and that the suit mentioned above was commenced upon mere spleen. However, this petition was insufficient to ward off the suit of STEPKIN v. DOBBINS. (fn 39) The report of the evidence in this case is reprinted below. This was a cause of office, prompted by John Stepkin of Stepney, co. Middlesex, gent, against Daniel Dobbins of the City of London, for writing himself "Esquire" and assuming a coat of arms. The defense alleged the Defendant to be a freeman of the City of London and a member of the Turkey, East India, and Muscovy Companies, and of the Haberdashers' Company. In a feoffment dated 28th Oct 1518 Guy Dobbins, the Defendant's great great grandfather, and in a bond dated 4th December 1532 Guy Dobyns, the Defendant's great grandfather, were described as gentlemen. The Defendant's father was educated in the University of Oxford and was afterwards taught the law of the land. The Defendant's mother was of the families of Scudamore, Croft, Kirle and Vaughan in the county of Hereford, and the Defendant was lord of some manors in the county of Worcester. The heralds summoned the Defendant to the Visitation of the City of London about three years previously. 1. James Kirle of Walford, co. Hereford, esq. ; lived there for 30 years; born at Shopden, co. Hereford; aged 42. The mother of the Defendant was sister to Robert Kirle, esq., the Deponent's father. Randall Dobbins, father of the Defendant, was always reputed to be a gentleman. 2. Francis Kirle of Mutch Martle, co. Hereford, esq. ; lived there for 36 years; born at Walford; aged 44. Defendant's mother was sister to Robert Kirle, esq., who was son of Walter Kirle, Esq., who married a daughter of [blank] Warmecombe, esq. ; and by that match the Defenant's mother is allied to an ancient family of the houses of Scudamore, Croft and Kirle. Defendants mother and Deponent's father are brother's children. 3. Thomas Goode of Redmarley Dabitott, co. Worcester, Esq. ; born there; aged 53. Deponent's great grandmother was named Dobbins and of kin to Randall Dobbins, the Defendant's father. 4. Henry Hyett of St. John's Bedwardyne, co. Worcester, gent; lived there for 12 years; born at New Place in Rodley in the Forest of Dean; aged 42. Deponent has in his custody a bond dated 2 Edw. VI in which Roger Dobbins of Newent, co. Gloucester, is styled a gentleman. Defendant's father was descended out of that family. Deponent also has in his custody a release dated 10 June, 4 Edw. 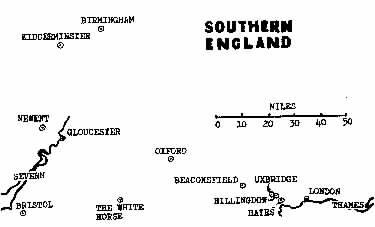 VI, by which William Bridgman of Great Deane, co. Gloucester, gent., released land in Dymock, co. Gloucester, to John Dobbins of Longden, co. Worcester, gent., who was elder brother of the half blood to William Dobbins, the Defendant's paternal grandfather. Deponent also has in his custody [Begin original page 13] a release dated 17 Aug, 4 Edw. VI by which Richard Brayne of Little Deane, co. Gloucester, esq. and others released land in Dymock to John Dobbins, then of Dymock, gent. Deponent also has in his custody eight counterparts of leases (one dated 20 July, 4 Edw VI; five dated 12 Eliz I, and two dated 19 Eliz I) wherein Giles Dobbins, son of the said John Dobbins, was mentioned to be a gentleman. Deponent also has in his custody the inquisition post mortem of John Dobbins, son of the said Giles. Defendant has land and living in Worcestershire to the annual value of £320. Deponent is of kin to the Defendant. Deponent was taxed in the last subsidy and for ship money. 5. Elias Arche of Kidderminster, co. Worcester, clothier; born there; aged 60. Defendant is lord of part of the manor of Kidderminster by purchase. 6. Nathaniel Eston, clerk, B.A., of Kidderminster; lived there for 12 years, born at Newton, co. Northampton; age 40. 7. Walter Kirle of Dymock, co. Gloucester, gent., lived there all his life; born at Shobdon, co. Hereford, aged 39. Defendant's mother was descended from the families of Abrahall and Kirle by the father's side and of kin to the families of Lord Scudamore, Harley, Croft, Blunt and Burrowe, all descended from sisters and coheirs of [blank] Warnecombe, esq. Deponent is a cousin german to the Defendant. 8. John Hyett of Newent, co. Gloucester, gent. ; lived there for three months, born at the New Place of Rodley in the Forest of Dean; aged 72. Deponent is allied to the Defendant by marriage, "but in what in degree he doth not nowe well remember." 9. Arnold Collwall of the City of Gloucester, notary public; lived there for 55 years; born at Newent; aged 76. Deponent is of kin to the Defendant. 10. Philip Dobbins of Newent, gent. ; born there; aged 48. Deponent has seen a deed dated 1 & 2 Ph. & M., in which Alexander Dobbins, a younger brother of the family, was styled gentleman, and also a deed dated at Newent on the feast of St. Lawrence, 23 Hen VI in which Guy Dobbins of Compton in Newent, an ancestor of the Defendant, is mentioned. Randall Dobbins was bred in the University of Oxford. Deponent is brother of the Defendant. 11. Thomas Dabitott of Redmarley Dabitott, co. Worcester, gent. ; born there; age 66. Deponent has in his custody a deed dated 11 Hen IV, in which one of the family of the Defendant's predecessors, then living at Dobbins' Place in Pauntley, co. Gloucester was named gentleman. Deponent's grandmother was a Dobbins. 12. Randall Dobbins of Newent, gent. ; born there; aged 80. Deponent was a student in St. Mary's Hall, Oxford, above 60 years ago, and is Defendant's father. Deponents wife's mother was descended from [blank] Warmecombe in co. Hereford, esq. on the father's side, and from the Bromwiches on the mothers's side. Deponent's wife's grandmother was descended from the Abrahalls and Rudhalls on the father's side. Alexander Dobbins was Deponent's grandfather's younger brother. Deponents great grandfather was Guy Dobbins. Deponent's wife is a Kirle by the father's side and cousin german to the Baronet Kirle now living in co. Hereford. Defendant was never a haberdasher, but only a merchant in London. 14. John Barker of Kidderminster, miller; lived there for one year; born at Bedwardyne, co. Worcester; aged 30. 12th February 1637/8 Dr. Tooker exhibited certain bonds in which the Defendant was described as a merchant and as citizen and haberdasher of London. 9th May 1638. The Earl Marshal ordered the Kings of Arms to certify their opinion of the evidences, instruments and exhibits, and also of an escutcheon of arms exhibited on the part of the Defendant, and whether the arms belonged to the Defendant by hereditary right, and by what right the Defendant assumed the title of "Esquire". 1st June 1638. Garter, Clarenceux and Norroy Kings of Arms certified that they did not find by anything produced before them that the Defendant was or any of his ancestors had been gentlemen of coat armour, but found that his grandfather and some other of his name inhabiting about the place where his father then dwelt were written gentlemen in divers evidences. They did not find the escutcheon of arms produced in Court to belong to the Defendant or his ancestors, nor that the Defendant had any right to call himself "Esquire". By the definitive sentence it was declared that the Defendant and his ancestors were plebeians and not gentlemen, and had no right to assume or bear arms, and that the Defendant had assumed arms and the titles of "gentleman" and "esquire". The Defendant was ordered to make submission, to enter into a bond for his good behaviour, to pay a fine of £20 and £20 costs. The Defendant petitioned the Earl Marshal, alleging that the Plaintiff, "whose malice hath not end or lymitt," required him to perform the sentence in the most ignominious and disgraceful manner at the open sessions at Worcester, and to confess himself and his ancestors to be plebians and not gentlemen. The Defendant further alleged that the heralds [Begin original page 15] had never denied that he and his ancestors were gentlemen, and prayed for the execution of the sentence to be suspended until he made it appear to the Earl Marshal that he was a gentleman of ancient descent, and that the deeds and writings which he had produced to prove his descent and birth might be returned to him. 23 December 1638. The execution of the sentence so far as acknowledgement was concerned was suspended; the evidences to be delivered and time given for proof until the first day of Easter term." It is interesting to speculate as to what effect the decision of the Court of Chivalry that DANIELG DOBYNS was not a gentleman of coat-armour might have had on his decision to enter politics. Could his decision to seek influential office have been provoked by his rejection by the establishment, as represented by the Court of Chivalry? Could this have been the reason why he joined with the group who wished to overthrow Charles I and replace Royal government with rule by Parliament? This was the time of the English Civil War, in which Oliver Cromwell and the Parliamentarians deposed and executed Charles I and assumed the government of England. And DANIEL DOBYNS was there in the midst of it all. Certainly he was in a position in which he might easily have some political influence. Through his marriage to URSULA, the fifth daughter of ROBERT WALLER of Amersham, Buckinghamshire, he was related to the great Parliamentarians of the day, as shown on the chart on page 16. URSULA's mother was ANN, the daughter of GRIFFITH HAMPDEN, and her mother's brother, WILLIAM HAMPDEN, was the father of the great Parliamentarian, Colonel JOHN HAMPDEN, to whom, of course, URSULA was thus first cousin. But URSULA's relationship to the great Parliamentarians of the day was even more intimate, for WILLIAM HAMPDEN, the father of Colonel JOHN HAMPDEN, had married ELIZABETH CROMWELL, the daughter of Sir HENRY CROMWELL, whose son ROBERT was the father of OLIVER CROMWELL, the Protector. The relationship therefore discloses that Colonel JOHN HAMPDEN numbered among his many first cousins, both OLIVER CROMWELL and URSULA, the wife of DANIELG DOBYNS. Consequently, it is not surprising that DANIEL DOBYNS became the leader of a Parliamentary group in Kidderminster, in a county which was otherwise almost solidly Royalist. Being a merchant, DANIEL DOBYNS was in a position to dispose of the wares of the weavers and manufacturers of Kidderminster, a group which stood almost solidly behind the Parliamentary cause. DANIEL DOBYNS was elected High Sheriff of Worcestershire in 1641, a Sequestration Commissioner in 1643, and one of the Parliamentary Committee for Worcestershire in 1646. (fn 40) On 6 Sept 1641 he gave his certificate as Sheriff, that, being appointed by act of Parliament to receive the poll money for Worcestershire, he had received £600 poll money from the Commissioners for Worcester limit which was a third part of the hundred of Oswaldslow. "To the most Excellent Prince Rupert His Highness: The humble petition of HENRY TOWNSHEND Esquire, on of H.M. Justices and Commissioners for the safeguard of the county of Worcester. Humbly Sheweth That Mr. DANIEL DOBBINS being His Majesty's High Sheriff and servant 3 years since for the County of Worcester, requested your petitioner to be bound with him in a bond for £200 for the payment of £100 with Interest for his better supportation in his Majesty's service; and for the better enabling your petitioner to discharge the said Bond, the said Mr. DOBBINS assigned unto him the receiving of his Rents within this County (of which he hath begun to collect some part of before your Highness' Commission for delinquent's estates, bears date, and a small sum of £10 to the relief and for the alimony of his Wife Mrs. DOBBINS and many small children upon her petition by [Begin original page 16] letter. Yet information being given that the said Mr. DOBBINS is a delinquent against his Majesty whereby his Lands and Rents are to be sequestered (as your petitioner is informed) at your Highness' disposing, And the Creditors pressing and calling daily for his money to your petitioner who through these distracted times, and his continual employments and charges in his Majesty's service for this County, is very much disabled. Doth most humbly crave That your Highness will be pleased to grant leave and liberty for your petitioner to receive the residue of so much Rents out of Mr. DOBBINS' estate as will discharge the said Bond, with the Interest and the Alimony money. And that the Tenants of Mr. DOBBINS may not be remanded to pay in such sums as your petitioners hath received of them; together with directions to the Commissioners of Delinquents' Estates in this County to approve the same upon Account unto them. For which your Petitioner shall ever pray, etc." "Shrewsbury, May 9th 1644. I refer the consideration of this petition to the Commissioners of Delinquents' Estates in the County of Worcester and do require them, that if the Allegations of the said petitioner appear to them to be true in such sort as is therein set forth, that then they take such further order for the satisfaction of the petitioner as shall be just. And that of their doing herein they give me an Account. Rupert"
"Whereas I am truly informed of the loyalty and good affection of Mrs. URSULA DOBBINS wife of Mr. DANIEL DOBBINS she beareth unto His Majesty. And for that she hath and duly doth pay her contribution towards the maintenance of His Majesty's Army and all others whom it may concern, that they and every one of them do forebear to molest trouble of interrupt the person of the said URSULA DOBBINS wife of Mr. DANIEL DOBBINS aforesaid, her children or servants, nor any their goods household stuff cattle horses hay corn or any other goods to drive plunder or carry away by violence any of the goods appertaining to the said Mrs. URSULA DOBBINS. Hereof you nor any of you may fail as you will answer to the contrary at your utmost peril. Given under my hand and seal this 3rd day of March 1645/6. Jacob Astley"
Though her husband had been deprived of his estates, though she was so nearly related to the leaders of the Parliamentary Army, and though she was helplessly in the power of enemies, chivalry had decreed that no man of that vast army might molest URSULA DOBYNS in her domestic duties. She was left free to care for her "many small children," being then in fact, seven in number. These were very difficult times for DANIELG DOBYNS, and he must often have reflected upon the doubtful wisdom of following political ventures, rather than keeping to his commercial pursuits. But he was ambitious. At the risk of his financial position, by borrowing from his father and from his cousin HENRY TOWNSHEND -- of which we have documentary evidence -- he sought influential positions and power, which, as a merchant, were denied to him. The period of 1644-1646 was the low period in the political fortunes of DANIEL DOBYNS. In the latter part of 1646, Charles I was completely defeated, and the fortunes of DANIEL took a definite turn for the better. On 6 Jan 1647, he was elected Member of Parliament for Bewdley, a then small town a short distance from Kidderminster. From then until the time of his death in November 1663, he appears to have devoted himself to the consolidation of his position, and, in spite of his early attachment to the Parliamentary cause, he saved himself from any disastrous consequences when Charles II was restored to the throne in May 1660. Not all of the members of the family were so successful in preserving life and property throughout the Civil War and the Restoration. EDMUND WALLER, URSULA DOBYNS' brother, forsaking the Parliamentary cause, was subsequently heavily fined and deported for his attempt to restore the King, and though his escape from execution is attributed to his relationship to Cromwell, his brother-in-law NAT TOMKINS -- married to his sister CECILIA -- was executed for his part in the same plot. Provided that if either of my said Children shall molest or refuse to submitt to this my will that such Child or Children shalbee utterly debarred from any benefitt of their said Annuities or estate untill they shall fully conform thereunto And I doe appoynt my sonnes Robert and Daniell to bee at the disposeing and ordering of my Executors And I doe hereby of this my last will and testament make my sonne in law Nicholas Truserll gent Richard Dobins my sonne and Richard Dedderot gent full and sole executors of this my will revokeing all others and I doo desire my honored friends ffrancis Finch Esquire and Edmond Waller esquire to be ayding and assisting to my Executors and overseers hereof And I do give to each of them a ring of Twenty shillings price to wear for my sake. ¶15 RICHARDH DOBYNS (DANIELG, RANDALLF, WILLIAME, GUYD, GUYC, JOHNB, GUYC) (from ¶14) was born about 1631. He was married several times. It is known that he was a widower when he remarried in 1669/70, but it is not certain who his first wife was. His first wife may have been ELIZABETH CROSIER. RICHARD DOBBINS, who may have been RICHARDH DOBYNS, was granted a Faculty Office marriage license (fn 42) to marry ELIZABETH CROSIER in April 1666. And according to the parish register of St. Paul Covent Gardens, London, Mr. RICHARD DOBBINS married Mrs. (i.e. Mistress) ELIZABETH CROSIAR, by license, on 23 Mar 1666. How he got married by license before getting the license must remain a question for the reader. Or RICHARD's first wife may have been JANE LAMBERT. According to the Parish Register, Book 2, page 23, line 6 of the Parish Church of St. George the Martyr, Southwark, London, "RICHARD DOBBINS and JANE LAMBERT were married the 12th Day of Mar 1654 by Mr. Sam: Hyland." It is also possible that RICHARDH DOBYNS first married JANE LAMBERT who died before he married ELIZABETH CROSIAR. Or it is possible that neither of these was his first wife. CATHERINE apparently did not live long, because on 17 Nov 1673, RICHARD DOBYNS of Hanwell, Middlesex, gent., widower, about 35 (again) and ALICE BATEMAN of the same place, spinster, about 20, with the consent of her father, RICHARD BATEMAN, gent., were granted license to marry at St. Botolph, Bishopsgate, London. Hanwell and Workesbridge (i.e. Uxbridge) are also former villages which are now part of Greater London. The DANIEL DOBYNS of Workesbridge who made the allegation was undoubtedly DANIELH DOBYNS, brother of RICHARDH DOBYNS. In May 1671 (fn 44) at a court session held at Westminster, Timothy Fly of Woxbridge (i.e. Uxbridge, Worksbridge, etc.) mercer, appealed from his conviction "June last for suffering an unlawful conventicle to be held in his house at Woxbridge." The court considered the appeal unjust and ordered him to pay £20/4/8 (costs) to RICHARD DOBBINS and Thomas Langston, prosecutors. This could be the same RICHARD as RICHARDH DOBYNS; at least RICHARDH DOBYNS lived near Uxbridge. ¶16 CECILIAH DOBYNS (DANIELG, RANDALLF, WILLIAME, GUYD, GUYC, JOHNB, GUYA) (from ¶14) was married to NICHOLAS TRUSSELL, who was executor of her father's will. There was a suit in 1664 (fn 45) styled RICHARD DOBINS v. NICHOLAS TRUSSELL over whether or not her £500 settlement (dowry?) money was already paid to TRUSSELL. ¶18 ROBERTH DOBYNS (DANIELG, RANDALLF, WILLIAME, GUYD, GUYC, JOHNB, GUYA) (from ¶14) was born about 1646. On 7 May 1668, ROBERT DOBBINS was admitted to the Haberdasher's Company, London (fn 47) by right of patrimony per DAN DOBBINS. That is, he was not required to go through a period of apprenticeship, because his father was a member of the company at the time he was born. On 24 Feb 1670/1, ROBERT DOBBINS of St. Clement Danes, Middlesex, Citizen and Haberdasher of London, bachelor, about 24, was granted a license (fn 48) to marry ANNE SMITH of Morton in the parish of Dinton, Buckinghamshire, spinster, about 19, with the consent of her father, to be married at Dinton. ¶19 DANIELH DOBYNS (DANIELG, RANDALLF, WILLIAME, GUYD, GUYC, JOHNB, GUYA) (from ¶14) was born about 1650. On 2 Apr 1672, DANIEL DOBYNS of Kidderminster, Worcestershire, gent., bachelor, about 22, was granted a license (fn 49) to marry MARGARET BRABANT of Hillingdon, Middlesex, spinster, about 21, with her mother's consent and upon allegation of ROBERT DOBYNS of St. Bride's, London, Citizen and Haberdasher, to be married at Chiswick, Middlesex. In 1695 (fn 50) DANIEL DOBBINS, his wife MARTHA, son DANIEL and daughter MARY, lived within the walls of the old City of London. In 1687, one DANIEL DOBBINS with WILLIAM FERRIS (fn 51) applied for a patent for a diversion called the Royal Adventure. Their petition was referred to the Attorney General or the Solicitor General, who reported that their invention was distant in nature from the Royal Oak Lottery and was not contained within the prohibition made by the grant thereof, but that it was not determined how far it may be prejudicial to former lotteries. One DANIEL DOBBINS became a quayman at the Port of London in 1691, (fn 52) promptly applied for a place as a patent waiter or a land waiter (a type of customs supervisor), was made a land waiter on 28 Feb 1695/6, and kept this post until the time of his death, which was entered in the Port of London records on 17 Jan 1700/1. Because of the similarity in death dates between this DANIEL DOBBINS and the DANIEL DOBYNS whose will is reported in the following paragraph, there seems to be a slight possibility that DANIEL DOBBINS the landwaiter is the DANIELH DOBYNS traced herein. However, there seems to be nothing to support this position. DANIELH DOBYNS wrote his will (fn 53) about 1700, writing himself as DANIEL DOBYNS of the parish of All Hallows Barking, London, gent., mentioning his wife MARTHA DOBYNS, son DANIEL DOBYNS, daughters MARY, KATHERINE, and ANNE DOBYNS. He stated that he was very weak in body, appointed his wife MARTHA and daughter KATHERINE as executors, his friends WILLIAM DOBBING Esq. (probably WILLIAM DOBYNS, Esq. of Lincoln's Inn) and JOHN FANSHAW, Esq. as overseers, and stated that he had directed his executors by word of mouth. Witnesses to this will were JOHN HALE (HALE was his wife MARTHA's maiden name), MARY MEASON and STE WEILLS. The will was proved at London on 8 Jan 1701/2 by MARTHA DOBYNS, his relict, and CATHERINE DOBYNS, his daughter. In a mortgage dated 28 Apr 1708 (fn 54) are listed MARTHA DOBINS of London, widow and relict of DANIELL DOBYNS, late of London, gent., deceased and DANIELL DOBINS of London, gent., and MARY DOBINS of London, spinster, son and daughter of the said MARTHA by the said DANIELL her husband deceased. The mortgage is on land in Uxbridge late in the occupation of DANIELL DOBINS the father, who seems to have been DANIELH DOBYNS. The signatures on the document are written "MARTHA DOBYNS", "DANIEL DOBYNS", and "MARY DOBYNS". Another indenture of mortgage made 18 Feb 1711 lists MARY DOBYNS as then deceased and is signed by MARTHA and DANIEL DOBYNS. "the said DANIELL DOBYNS and EDMUND DOBYNS the grandchildren of the said DANIEL DOBYNS deceased that is to say the sonnes of (blank space in original document) DOBYNS deceased who was the oldest sonne of the said DANIEL DOBYNS being not contented with the Annyties and Legacies to them respectively bequeathed by the said Will and Go(o)dwill as aforesaid and by combination and confederasy with divers other persons unknown to your orators having gotten into their or one of their Custody or into the Custody of the other persons aforesaid the Original Will They the said Confederasy doe endeavor to suppress and conceal the same and doe threaten and give out that they will enter into and take possion of the said Lands Tythes and premisses and that the same doe belonge unto them or one of them as heirs at law unto the said DANIELL DOBYNS deceased...."
These allegations are dated 3 Aug 1664. Which allegations DANIEL and EDMUND, being minors, denied by their duly assigned guardian, GEORGE GWILLIM, dated "...entyeth" (partly illegible, probably twentyeth) Oct 1664. As it is known from the 1634 Visitation of London that EDMUNDH DOBYNS was the oldest son of DANIELG DOBYNS and from his father's will that he was dead by 1664, it is thus seen that EDMUND DOBYNS was the father of two sons, DANIELI DOBYNS and EDMUNDI DOBYNS. ¶21 DANIELI DOBYNS (EDMUNDH, DANIELG, RANDALLF, WILLIAME, GUYD, GUYC, JOHNB, GUYA) (from ¶20) was, by strong circumstantial evidence, the emigrant to Essex Co. Va., whose descendants are traced in the following chapters. The emigrant spelled his name "DOBYNS", a spelling which seems to have been used by only about one fourth of the English families of the name at the time. In addition to the name "DANIEL" being the same, there are other similarities. The emigrant, DANIEL DOBYNS, named his three oldest sons RICHARD DOBYNS, DANIEL DOBYNS and EDMUND DOBYNS. RICHARDH DOBYNS [Begin original page 22] was the oldest uncle of DANIELI DOBYNS. As DANIEL's father EDMUND apparently died fairly young, his uncle RICHARD may have been partially responsible for his upbringing. Thus, if DANIELI DOBYNS was the emigrant, he had good reason for naming his oldest son RICHARD DOBYNS. EDMUNDH DOBYNS was the father of DANIELI DOBYNS, and EDMUNDI DOBYNS was his brother. Thus, if DANIELI DOBYNS was the emigrant, he would have had good reason to name his third son EDMUND DOBYNS. And, in addition to being his own name, DANIEL DOBYNS was the name of his own relatively well-known grandfather DANIELG DOBYNS, giving good reason for naming his second son DANIEL DOBYNS. The great-grandfather RANDALLF DOBYNS and great-uncle PHILIPG DOBYNS of DANIELI DOBYNS were lawyers, and the grandfather DANIELG DOBYNS of DANIELI DOBYNS was a Member of Parliament. Thus, if DANIELI DOBYNS was the emigrant, he had some reason for seeking public office and a possible inclination toward the law. DANIEL DOBYNS the emigrant was a Justice of the Peace of Essex County, at a time when the office of Justice of the Peace was an office of some influence requiring more than a casual knowledge of the law. Furthermore, a diligent search of the records has shown no trace of DANIELI DOBYNS in England after 1664. It seems a reasonable conclusion, although based upon circumstantial evidence, to hold that DANIELI DOBYNS of Kidderminster, Worcestershire, was the same DANIELI DOBYNS who emigrated to Essex Co. Va about 1675, and who appears in ¶22 of Chapter II following.